By Tim Royner: Luis ‘King Kong’ Ortiz has a chance of facing Dillian Whyte on December 22 if Dereck Chisora doesn’t want the fight for if it can’t be negotiated, according to promoter Eddie Hearn. Hearn says he must know by week which of the two heavyweights that will be facing Whyte on December 22. Hearn likes Ortiz or Chisora for Whyte. It’s just whichever makes the most sense. The fight that Hearn is trying to make is a rematch between Whyte (24-1, 17 KOs) and Chisora (29-8, 21 KOs) for December 22 on Sky Box Office. However, Hearn says he’d be willing to make the Ortiz vs. Whyte fight as a WBC title eliminator. The winner of the fight will be WBC middleweight champion Deontay Wilder. Hearn would like that very much, as he’s been waiting for the World Boxing Council to make Whyte the mandatory challenger for Wilder for over a year now but the WBC hasn’t been willing to do that because of the guys he’s been matched against. Earlier on Friday, Whyte, 30, called out former heavyweight title challenger Ortiz in response to him calling him out. Whyte says he would like to fight Ortiz, 39, on December 22. However, Hearn is the one with the final say so in whether Whyte faces Ortiz on December 22, and it appears that he’s still mostly interested in matching him against former world title challenger Chisora on December 22. In terms of money and risk, Chisora is the better fight for Whyte. He can make more money fighting him than he can against Ortiz, who the British fans aren’t as familiar with. Chisora has been around forever as a pro, and fans have seen his important fights against Vitali Klitschko, David Haye, Tyson Fury [twice], Agit Kabayel, Kubrat Pulev, Carlos Takam, Dillian Whyte, Robert Helenius, Malik Scott, Danny Williams and Sam Sexton. In the case of Ortiz, the UK fans have only seen a few of his fights against Deontay Wilder, Dave Allen and Malik Scott. “Yeah, he called him out for December 22,” Hearn said to IFl TV about Whyte calling out Luis Ortiz. “I spoke to Luis Ortiz’s people earlier, but not about the Dillian Whyte fight. I’d love to make the Luis Ortiz fight for December 22. If [Dereck] Chisora don’t want the fight or if a deal can’t be done, then he’s ready. 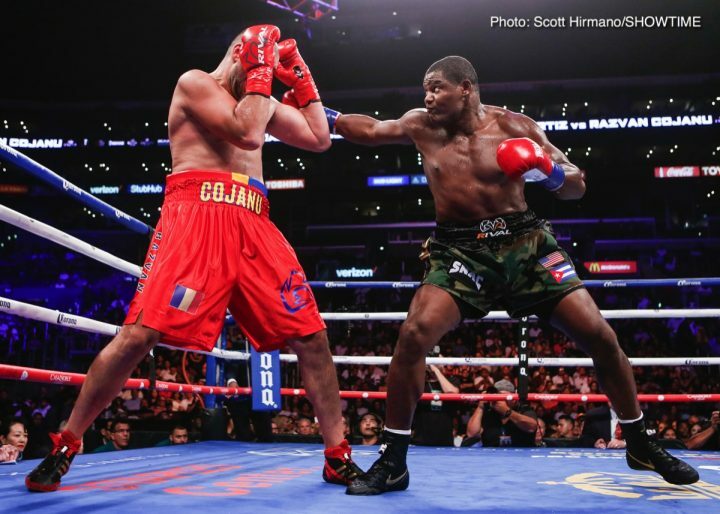 If Luis Ortiz really wants the fight, then let’s do it. The WBC eliminator can get made. The end of next week, we’ve got to know,” Hearn said. It sounds like it’s up to Chisora whether he wants the fight with Whyte badly enough to negotiate along the lines of what Dillian and Hearn both want for the December 22 rematch to take place between the two. Assuming that Chisora fails to agree to the monetary split that Whyte and Hearn wants for him to accept, then Ortiz might be the guy that winds up facing Dillian on the 22nd of December. It’ll require courage for Whyte to face Ortiz, because this is a fight that could be too much of a step up for him. Ortiz does well against guy with moderate power and size like Whyte.